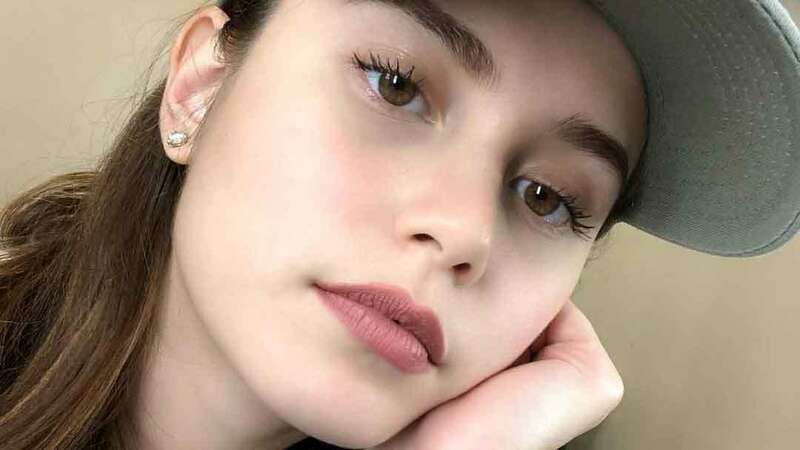 Jessy Mendiola slams bashers questioning why she and her boyfriend, TV host and actor Luis Manzano, have not gotten married yet to prove their love for each other. Yesterday, January 27, Luis posted on his Instagram account three photos of him with Jessy and a photo of Jessy. He captioned the post, "I can no longer imagine vacations without you. You make everything so much more beautiful :) Hi, How :) Right beside you now habang nagte-text ka. Thanks, boss @rexatienza, for the pic :)." The couple were recently in Boracay Island, Aklan for a short vacation with Luis' glam team to celebrate "an awesome 2017," as Luis put it on one of his Instagram posts. Netizens were quick to comment on the photos. Many were hoping that the two get married already, or were asking when they would be getting married. One user, @mariabasha_10, wrote, "Pakasalan mo nga kung totoo 'yan. Nasa tamang edad ka na kaya alam mo na kung SIYA NA NGA ANG THE ONE MO." Another Instagram user, @chocalot149, asked, "Why is it [that] in our culture kung mahal mo ang tao, kasal agad ang iniisip ng mga tao???!???? But Jessy is perfect for him." 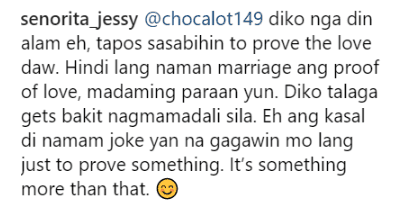 Jessy replied to @chocalot149's comment: "@chocalot149 'Di ko nga rin alam, eh, tapos sasabihin to prove the love daw. Hindi lang naman marriage ang proof of love, madaming paraan yun. 'Di ko talaga gets bakit nagmamadali sila. Eh, ang kasal, 'di naman joke 'yan na gagawin mo lang just to prove something. It's something more than that." Jessy and Luis celebrated their first anniversary in June 2017. On June 25, 2017, Luis posted on Instagram a photo of him and Jessy, and captioned it [in part]: "Happy Anniversary to you, Wowow :) Thank you for leaving a smile on my face after a year and looking forward to many more :)." Keep fighting for what you believe in, Jessy and Luis!